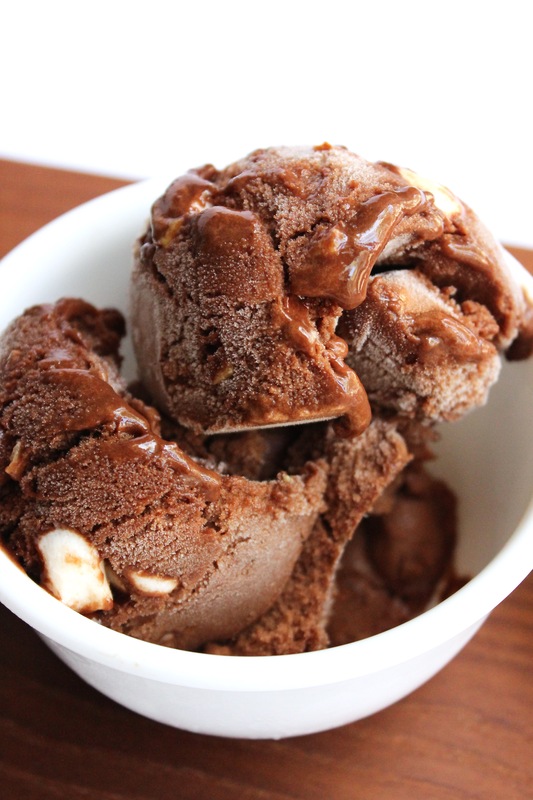 Nice Cream is Never Naughty! Have you been naughty or nice this year? Well, one thing is for sure, nice cream is ALWAYS nice! This week’s recipe was created by a good friend of mine, Melissa, who is the author of So Much Yum Blog. She makes the best plant-based creations, is a registered dietician, takes the most beautiful food photos, and loves kitties. What’s not to love about all that? Hope you enjoy her recipe below and try it out for the holidays! Happy healthy holidays everyone! When people ask me if it’s hard being vegan, my honest answer is always an enthusiastic no. Why? Because NICE CREAM. Now if nice cream didn’t exist, my answer might be different. Ice cream is essential to life, and I’ve found that NICE cream is a completely delicious alternative if you can’t have the real deal dairy stuff. 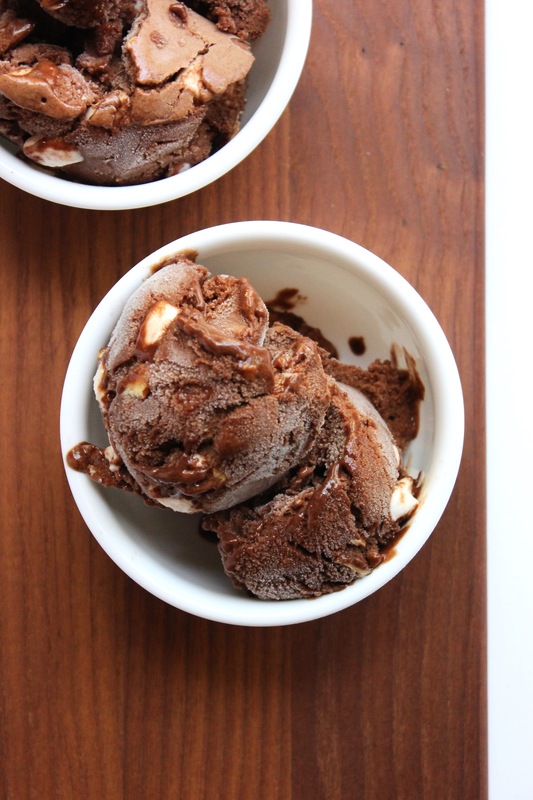 Of all the nice cream I’ve made, this rocky road version is my favorite so far. Ice cream? Like, who even needs that when you have THIS! Creamy chocolate goodness, sweet (vegan) marshmallows, crunchy toasted almonds. Your world is about to be rocked with this one. If sliced almonds not already toasted: Preheat oven to 350°F. Evenly spread almonds on a baking sheet and toast for 8-10 minutes until lightly browned and fragrant. Let cool completely. In a food processor, blend the frozen bananas until completely smooth and creamy. This will take several minutes. Scrape down the sides and lid as needed. You may need to blend in two batches if your food processor is small. Add cocoa and agave, and continue blending until completely combined. Transfer banana mixture into a large bowl. Add almonds and marshmallows, and stir to combine. Transfer nice cream into freezer-safe container (I use a metal loaf tin), cover with plastic wrap, and freeze for at least 4 hours or until at desired firmness. If left overnight, the ice cream will harden but will still be scoop-able with an ice cream scoop. Nice cream can also be eaten right away without refreezing but will be more like soft serve (which is as equally delicious). Melissa was born in Portland, Oregon, and spent the first 20 years of her life there before moving to Southern California (where she currently resides) to finish her nutrition degree. She is now a registered dietitian, board certified specialist in sports dietetics, Jazzercise instructor, ACSM certified personal trainer, and author of the plant-based food blog So Much Yum. She also recently got married to a hunky firefighter who acts as taste tester and occasional photography assistant. When not being a dietitian, teaching Jazzericse or blogging, she loves doing crossword puzzles and daydreaming about when she will finally get to adopt two fur-baby kittens! For more about Melissa, you can visit her blog here or check her out on Instagram! Yoga pants - not just for yoga anymore!